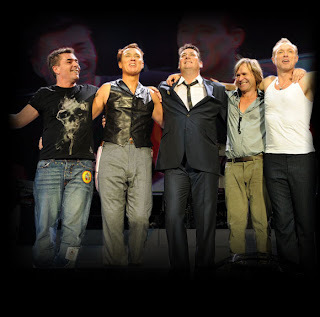 WAIST HIGH: Spandau Ballet Has A New Reformation Tour Page. Spandau Ballet Has A New Reformation Tour Page. From Spandau Ballet: To celebrate the reformation of the band for an amazing extended year of live performances and new album and concert film, spandauballet.com has a brand new Reformation Tour Page. Featuring a Reformation Tour merchandise section with an increased range of discounted tour merchandise including a poster, vintage t- shirts, hoodies, badges and the tour programme, previously only available at venues, to add to the range of Spandau Ballet merchandise, music and dvd’s already available in the store. The new page also features an exclusive piece written by journalist Paul Simper, specially selected videos including the band first live performance on Jonathon Ross, backstage footage from Dublin and a photo gallery which will feature a series of different images from the great year over the next few months starting with images from the O2 London.